Are you READY to get fit? We love personal trainers but when you can't afford one all the time, My Gym Trainer is for you! My Trainer Fitness Gym Trainer manuals are 3-ring binders with 24 Sturdy Removable Laminated Exercise Cards of Complete Workouts to take with you to the gym. Based on 6 workouts/wk, the day 7 card is a day of rest with tips & information. Workouts average 30-60 min. and are ~50% cardio and ~50% resistance training, for a 4-8 week cycle. Every workout has been designed by a certified personal trainer and organized to be complete and easy to follow and is for anyone who wants to generate greater results in the gym: lose body fat, feel energized, tone muscle and keep fitness interesting and effective. 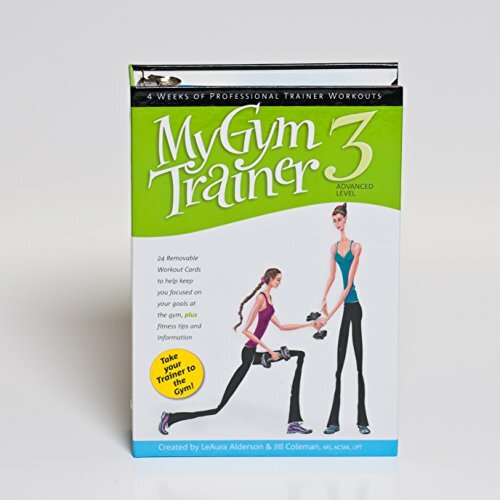 The My Gym Trainer series (Books 1, 2 and 3) offers a systematic approach to results, while eliminating the guesswork. After a month or two of going through the workouts you start over again with the Week 1, Day 1 card, so 24 complete sessions before you repeat any one workout. In addition, My Gym Trainer is very useful for busy trainers as a handy, at-your- fingertips integrated workout program you can incorporate into your client routines or your own. Many PTs don't want to have to create their own workouts after doing that for clients all day, and they find MGT3 a powerful workout they can do without having think about it. PROVEN WORKOUT SYSTEM to help you achieve personal trainer results on your own for a fraction of the cost. Get help at the gym and get fit faster with more effective exercises and complete workouts for steady weight loss, muscle toning and muscle definition. For best results, use 6 days per week for 4 weeks of variety before beginning the cycle over. Each complete session takes around 60 minutes and is approximately 50% cardio and 50% weight training. INCLUDES TIPS, INFORMATION & JOURNAL CARDS: All workouts are completely adaptable to personalize to your fitness level and your gym. Each resistance circuit rotates through specific areas of the body in an effective systematic fashion. All workouts include strength and resistance training using weights: dumbbells, barbells, gym machines and equipment and body weight, plus cardio using treadmills, elliptical machines, recumbent and stationery bikes, plus plyometrics. THE ONLY GYM WORKOUT CARDS featuring 24 complete workouts you can take with you to the gym. Weight training on one side, cardio on the other, for 24-48 workouts before starting the cycle over. Strength circuit exercises using weight machines, free weights, dumbbells, barbells and body weight for comprehensive strength and resistance training for men and women. Take your trainer to the Gym with My Trainer Fitness Workout System, your personal trainer to go. Each My Gym Trainer manual can last you months and even years with enough variety and options to keep your exercise workouts interesting. MY GYM TRAINER 3-ADVANCED, is for the fit and experienced exerciser, who likes to change things up for continued fitness growth, and who loves a challenging gym workout. Whether you're doing CrossFit, P90X, or are a personal trainer or a pro athlete, My Gym Trainer 3-Advanced will take you to your next level. Even if you know what to do at the gym, athletes and personal trainers also use My Gym Trainers for themselves for a break in creating their own when they've been creating them all week for their clients. FOR MORE BENEFIT IN LESS TIME, you can make you're My Gym Trainer last longer by splitting up your cardio and weight sessions. Instead of approximate 60 minute workouts, it would be more like 30 minutes of fast fitness by doing cardio on one day and strength training on the next. The benefit there is less time each day, leaving you the energy for more intensity because you have more energy to pour into each workout for the benefits of High Intensity Interval Training (HIIT), and 8 weeks of workouts before starting the cycle over.